The team at Auto Care Plus in Orange and CA car owners are all talking MPG right now. Better gas mileage. Fewer emissions. Orange drivers want to save the environment and their pocketbooks. And we all know—or should know—that preventive maintenance will help maximize MPG. But is there something more Orange motorists can do? After all, some of us Orange folks can’t cut back on our driving, and others would like to do more to economize. Weight is one major enemy of fuel economy. The more you lug around in your vehicle, the more fuel you have to burn to get from Orange to La Habra. And that means buying more gas in Orange and producing more emissions. Of course, your SUV’s weight isn’t negotiable. And you can’t do much about the weight of your passengers. And this isn’t an article about diet and exercise. But look around your SUV. Are you hauling a bunch of unnecessary weight around CA? Do you really need your golf clubs every time you leave your Orange home? Store sports equipment in the garage. Load it when you need it and store it when you don’t. Who knows? The extra exercise just might reduce the other type of weight in your vehicle. Clean out your Orange. You’d be surprised how much weight you’re lugging around Orange in plain old junk. Toss old papers, leftover food, and regular old dirt. Even if it’s not a lot of weight, you’ll feel better when you get into your car. A good cleaning is also part of good car care. Now, don’t toss stuff you really do need. You do need that spare tire—the one in your trunk. And a kit of emergency essentials is not a bad idea. But just carry around the day-to-day essentials. You can pack a more extensive kit and store it in your garage, then toss it in your Orange when you go on a longer trip, but you don’t have to lug it around all the time. After all, are you a driver? Or are you a junk chauffeur? Lose the junk and save some money in Orange. Most CA motorists know that their vehicles need regular preventive maintenance like changing the oil and filters, rotating the tires and refilling the washer fluid. But did you know that your air conditioning system needs routine maintenance as well? Taking care of your air conditioning system can extend its life and prevent costly repair bills. Why is it essential for Buena Park car owners to get routine maintenance on their air conditioning system? First, the refrigerant contains an added lubricant. 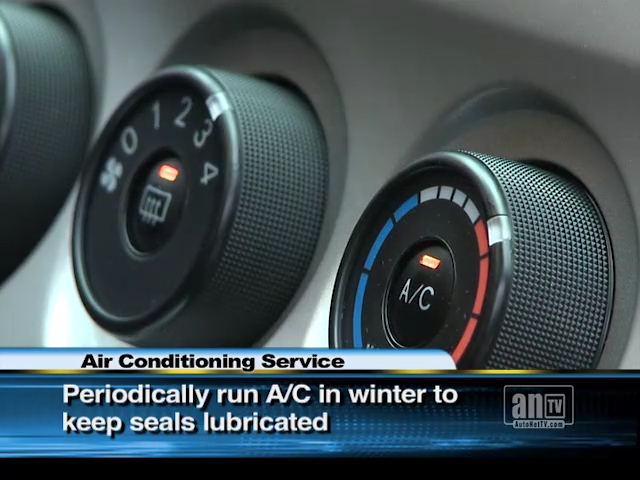 As the refrigerant circulates through the air conditioning system, its parts are lubricated. This constant lubrication keeps the parts functioning well. But over time, this lubricant is used up, and without it, the parts will eventually seize up and fail. Orange folks should understand, however, that the air conditioner will continue to pump out cool air even without the lubricant, so you won’t know the system is sick until it actually dies. So good car care includes regularly checking the refrigerant and lubricant in your SUV air conditioning system and replacing it if needed. The second reason your air conditioning system needs preventive maintenance is that air and water can get into the system. Air, water and the contaminants they contain will reduce the efficiency of the air conditioning system and can cause corrosion of the system’s parts. Keeping the air conditioning system clean is a critical practice and will extend its life and keep you from losing your cool on hot Buena Park days. Here’s a good piece of auto advice for CA drivers that will extend the life of their air conditioning systems: You should run your air conditioner in the winter every once in a while. This circulates the refrigerant, which lubricates the seals. That way, they won’t dry out during cold Orange weather. So, after learning about preventive maintenance for your A/C, you might now be wondering if your air conditioner is in trouble. Two early warning signs of a failing air conditioner are (1) the air just isn’t getting as cold as it used to and (2) there’s a strange noise when the air conditioner turns on. If you notice either of these symptoms in your SUV, you should bring it to Auto Care Plus in Orange as soon as possible. Just some good auto advice to keep you cool in Buena Park and keep you on the road! For those of you in Orange CA who pay attention to these things, you may have been hearing about the new direct injection engines and want to learn more about them. Some deliver the power of a V8 with the economy of a V6. Fuel injectors are precision instruments. They have to deliver a precise amount of fuel at exactly the right time. The design of the engine also dictates a particular spray pattern for the fuel. If a fuel injector is dirty or gummed up, it can’t do its job as well. That means less power and worse fuel economy for your SUV and can lead to damaged fuel injectors. A professional fuel system cleaning from Auto Care Plus gets out the gum and varnish in the whole system, including the fuel injectors. Keep those injectors clean and they’ll last a long, long time. Safe CA travel starts with preventive maintenance and good car care at Auto Care Plus. But there are other things Orange drivers can do to prepare for emergencies on the road. Here’s some auto advice that can help you plan for emergencies, and just may save your life — or someone else’s. First, Orange motorists should consider keeping an auto emergency kit in their car. The kit should contain items that will allow you to deal with common emergencies on the road. Some vital items you should carry in your SUV include jumper cables (or a booster box), flares, a flashlight and some basic hand tools. Other useful items include gloves, two quarts of oil, some antifreeze, water and everything you need to change a tire. You might also consider a can of tire inflator, which is a great temporary fix for minor flats. But taking care of your SUV is only part of emergency preparedness. It is critical to take care of the people in the car, too. For this reason, you should carry a first aid kit, drinkable water and blankets. Other items to consider include high-calorie food items (like energy bars), toilet paper, a towel, a hat and boots. And, of course, when you travel in CA and out-of-state you should always have your cell phone, some emergency cash and a credit card. Depending on where you live, you may need to add other important items to this list. For example, sunscreen, sunglasses, and extra water would be good to have on hand in a hot climate. For the cold and snowy CA season, some salt, a hand shovel, emergency blankets and matches might be in order. Also, if your CA area is prone to severe weather or earthquakes, you should check with your local Red Cross or disaster preparedness office for their recommendations on what to keep on hand in your SUV for emergencies. When you travel away from your Orange home, you should check the weather forecasts before you leave, and pack appropriate emergency supplies. Also, do some research about the areas you will be traveling through so you can be prepared for the climate and terrain. Remember the basics: heat, water, shelter, light, and food. The automotive professionals at Auto Care Plus want Orange motorists to be safe. Preventive maintenance, proper planning, smart communication: these are the basics of safe travel. All modern Orange vehicles come with fuel injection systems, so it’s a topic Buena Park car owners need to know something about. The mighty fuel injector is a valve that delivers the gas or diesel fuel to the right place, in the right amount, at the right time; to be mixed with air and burned in the engine. So how many fuel injectors does your car have? There’s one for each cylinder. So four, six or eight for most folks in Orange, CA. Some vehicles have 10 or 12 cylinders. The engine control computer makes adjustments to the fuel injector as it monitors the engine and other sensors. Fuel injectors are a pretty high-tech. Auto Care Plus can help Buena Park motorists with a fuel injector cleaning service. What’s the benefit? In order to work right, the fuel injectors have to deliver the fuel at a precise pressure at a very precise time. It’s critical that the fuel is sprayed in a particular pattern as determined by the engine design. Over time, varnish can start to build up in the fuel injectors, effecting the pressure, pattern and timing of the fuel charge. The result is that the fuel doesn’t get burned as efficiently as it could. That robs performance and hurts fuel efficiency. What about dirty fuel – how does that affect the fuel injectors? The fuel injectors are the last stop in the fuel system. It starts at the fuel tank. Frankly, the best way to keep your fuel injectors working well is to use high quality fuel. It’s tempting to shop for bargains in Buena Park with fuel prices as high as they are, but major brands in the Orange, CA area have better detergents and additives and deliver consistent quality. What about a good fuel filter? The fuel filter is a key component of the fuel system. Its job is to filter out the dirt and rust that collect in the fuel tank. If it’s clogged up, the dirt will bypass the filter and head upstream to the fuel injectors. It’s vital to replace the fuel filter when your auto manufacturer recommends it. That’s part of a comprehensive fuel system cleaning. There are different kinds of fuel injection systems. Port fuel injection systems, the kind most gasoline engines have, operate at 60 pounds per square inch. The injectors for the new gas direct injection engines Orange motorists are starting to see require 10 to 30 times as much pressure. And some diesel engines for passenger vehicles have injectors that operate at 30,000 pounds or more per square inch. There’s no room for dirt and gum in a precision part like that. There are a lot of good products available in Orange, CA that can clean fuel injectors. They’re best used by Orange drivers to prevent fouling in the fuel injectors. Many can’t clean a seriously gummed up injector – that requires a professional deep cleaning, like those we offer at Auto Care Plus in Orange. But putting the cleaner in the fuel tank after you’ve had Auto Care Plus take a look at your fuel system will help keep it clean. Be sure to read the label for directions. Give us a call if you think your SUV may be ready for a fuel injector cleaning.